Publishing an Ezine is a lucrative business. More and more people are jumping on the Ezine publishing band wagon. Anyone can get an autoresponder and compile their own newsletters and e-courses to their subscribers at the cost of pennies. It is no surprise that Ezines are the choice of medium for list building and selling ad spaces. Part of the temptation for newbies is to collect a group of e-mails and start mailing out from their own personal e-mails. At first this may seem quite harmless when you have about 10-20 people in your list, but once your subscriber count exceeds 50 people, you are going to have a very big problem on your hand. Firstly, you will have to handle people who newly sign up on your list manually. People who wish to unsubscribe needs to be manually removed as well – causing you massive administration problems. The worst thing is most Internet service providers refuse to let you send bulk e-mails to many people at once. Of course, they set their own limits so that spammers won’t prey on the unsuspecting through their networks. If you are not careful, you might even lose your subscriber list as well because your entire list sits within your computer’s hard drive. If you do not backup your computer You might wind up losing hundreds or thousands of subscribers that you spent all those time and sleepless nights building them. Don’t be a fool – make sure you get a good and reliable autoresponder to handle all the work for you. 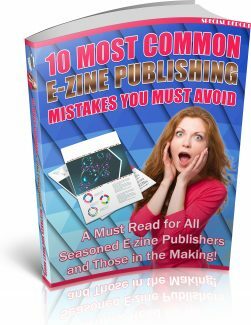 One of the biggest newbie mistakes when it comes to Ezines is signing up on other mailing lists without their permission. You think just because they are on one of my list, it automatically gives me permission to sign them up on some other list. Trust me – Unsolicited signups is a big no-no on the Net, and will get you in deep trouble! In the worst cast scenarios, you will be accused of spamming and you will get your IP blacklisted on the ISPs. You must do things the proper way. When you want to build your list or invite people to subscribe, make sure you mail them a proper invitation form (or landing page) and when they manually opt in again, then you will have their permission. Bear in mind that you must once again ‘convince’ them why they should opt-in to your new list and never ever take any shortcuts. Some publishers are so obsessed with getting traffic and selling things that all they ever do in their Ezines is sell products and talk all about themselves. Use their Ezines to boast about how great they are and how good their JV partners are doing to the point that they bore their subscribers to death. Another common problem is that the Ezine publishers load their Ezines with so many ads that it disrupts the reading pleasure of their readers. How would you like it if you were to buy the latest computer gadget magazine (if you are a guy) or the latest beauty magazine (for women) and dig through a haystack just to find the CONTENT page? I am sure you will either have a very hard time looking for the page number or you would cancel your subscription. Content is king. Never diverge from that. But even more important than that – relevant content for your subscribers should be the main deal. What you must do for your subscribers is to provide useful content roughly 80% of your Ezine and leave the rest for paid ads. It is a healthy balance. Not focusing on their business. Ultimately, publishing an Ezine is about making money. You can’t do it without promoting yourself or your business. In any business, remember that branding is the most important and you have to create that awareness in your Ezine while providing good content at the same time. Learn to use strategically placed affiliate links so that your prospects don’t feel as though they are being ‘sold to’. Talk about them first, then talk about a solution for them and then finally talk about YOUR solution for them. End everything with a call to action. That way, you will not be wasting traffic from your subscribers. Do you know that you should keep in touch with your subscribers as regularly as possible? There are millions of people on the Internet. If you don’t keep in touch with them, they will most likely forget all about you and your Ezine. Don’t ever let this happen to your business! It is easier to keep an existing customer or subscriber compared to getting a brand new one! Publishing regularly suggests to your readers that you are an organized and you are able to meet deadlines and commitments. You must learn to set aside some time for your publishing schedule. A way to accomplish this is to construct something like an E-course in advance. Then publish them everyday or every three days. Use this time to work on another product or come up with content for your Ezine. Even if you don’t have any special content for your subscribers, try and stay in touch with them as regularly as possible. Even a simple “Hi” followed by a link to another person’s site (preferably an affiliate program) will also do the job just fine! Part and parcel of the process of Ezine publishing is that you move from one issue to another. As you progress on, you will find that you have many back issues in your hard drive and sometimes, people tend to neglect the past issues as something outdated or useless. Unless your information is completely obsolete, there are many things you can do with a back issue. You can offer your archived issue as a sample issue to prospective subscribers on your website or your blog. People do read older issues and follow your journey. You'll be able to get more of your visitors that are on the "fence" to join your Ezine, giving you a bigger list to market your products to. Not only that, you will also attract a lot of new people looking to buy advertising space because they can check out your archived issues and check out how your ads worked out until now.